Industry 4.0 or in other words the fourth industrial revolution is not only an up and coming trend in the German industry but with Industry 4.0 as the main theme at this years’ World Economic Forum it can be seen as a worldwide movement towards the future of manufacturing and industry. However, it remains unclear which industrial technology will lead the way to the future of manufacturing. 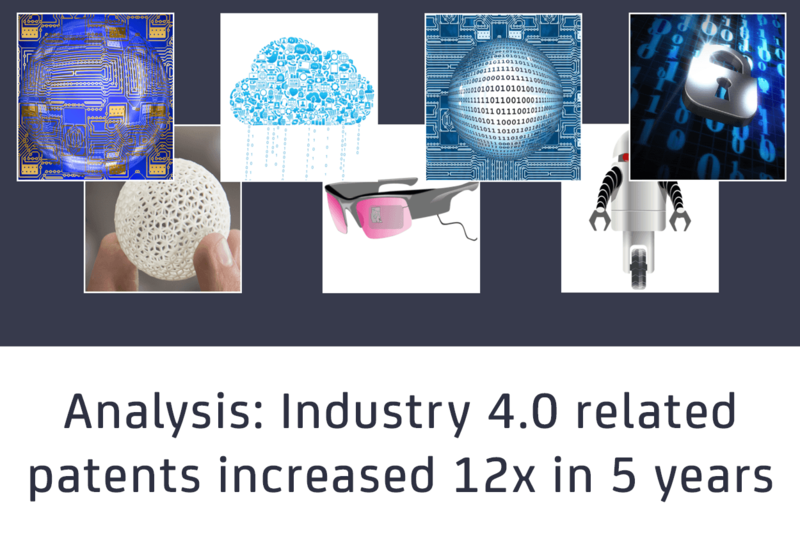 By analysing patent numbers of the past six years for the core Industry 4.0 technologies, we can give an indication. Unfortunately there is no widely accepted overall definition for the fourth industrial revolution and which technologies it includes. CPS form networks through (wireless) sensing and actuation and are able to respond to changing conditions or even anticipate changes in physical processes. Cloud computing makes it possible to move applications or services from local storage units into the internet. Big data refers to Datasets, which are larger than what typical database software tools can capture, store, manage and analyse. Big data analytics are ways of making them usable for industrial intelligence, for example enabling machine learning. Data and communication channels, as well as all other industrial systems, machines and components need to be adequately secured against cyber attacks. Using augmented reality glasses workers can receive instructions for the correct assembly of parts or assistance for commissioning. New technologies enable safer interaction for tasks such as pick and place or procedures in places humans can’t reach. Robot design is often inspired by human looks. With the current hype around Digital Transformation, Internet of Things, and Industry 4.0 it can be very difficult to understand where the hotbeds of innovation currently lie. 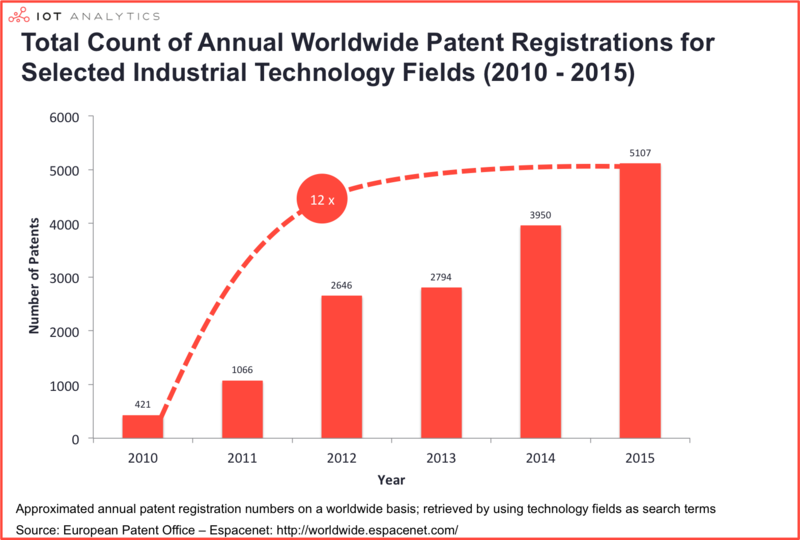 IoT Analytics analysed the worldwide numbers of relevant patents that were issued in the past years from 2010-2015. Patent count can be seen as an indicator for innovation activity. Main takeaway: The total annual count for the registration of Industry 4.0 related patents has exploded by a factor of 12x in just 5 years. 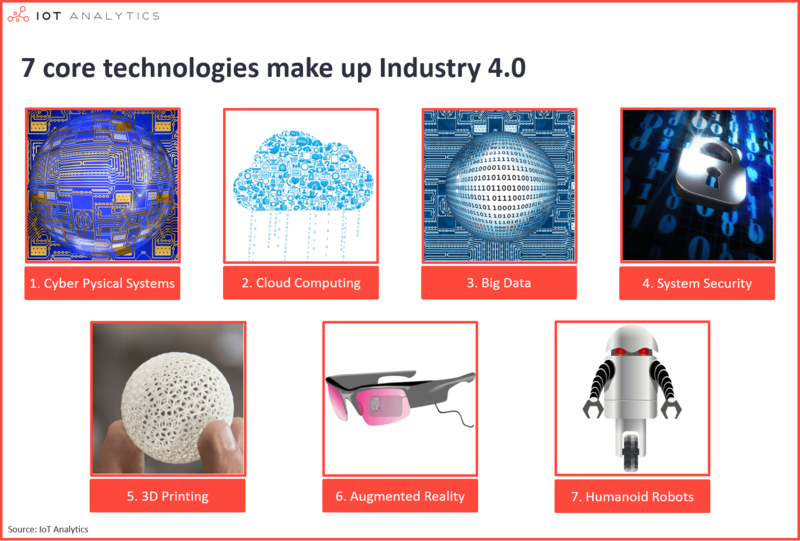 With a growth factor of 10x, 3D Printing, or additive manufacturing (AM), seems to be the next trending industrial technology. 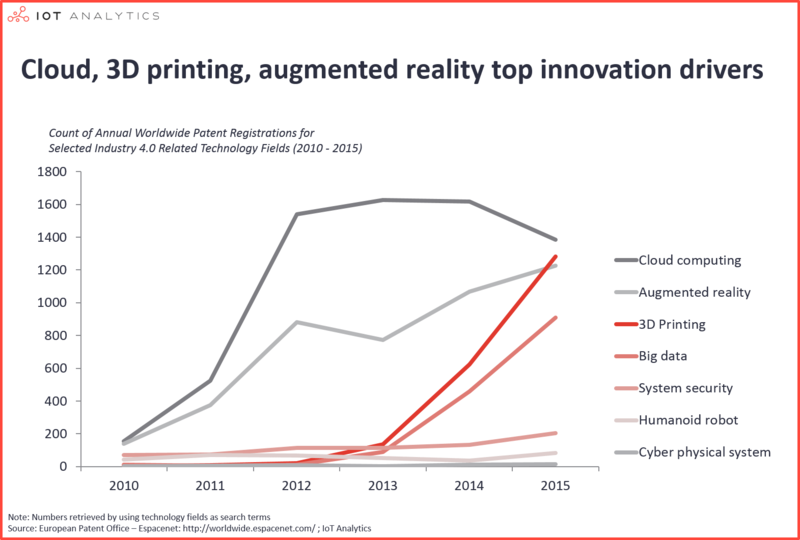 Having not yet reached its peak (over 1200 patents in 2015), 3D printing has now taken over augmented reality and is closely on the heels of cloud computing in order to become the shooting star of Industry 4.0 related patents in the next year or two. This is particularly interesting, because 3D Printing isn’t a specific internet technology, but rather qualifies as a new way of manufacturing and is therefore hardware based. A good example for the use of additive manufacturing is Airbus. Only recently has it become known, that the enterprise has installed a 3D Printer for the prototyping of helicopter parts. With over 1600 patents issued in both 2013 and 2014, it is biggest of the industrial technology fields that were analysed. 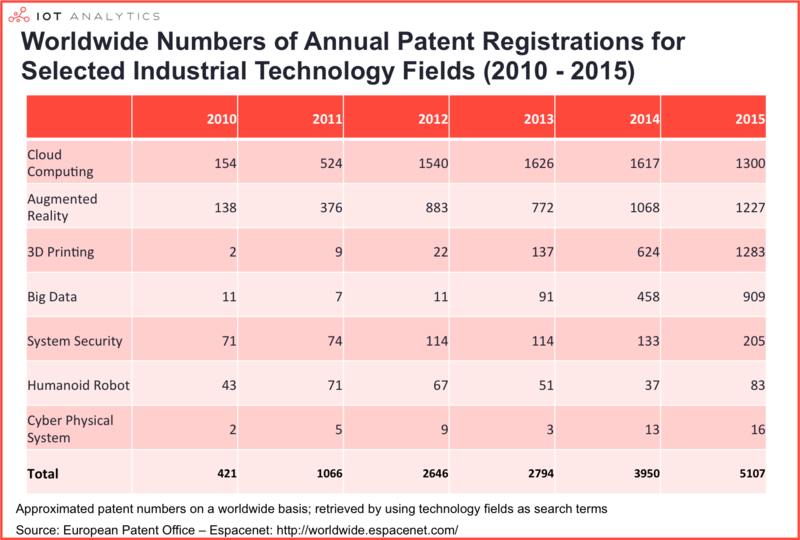 Starting off with only 150 patents in 2010, numbers increased by a factor of ten by 2012. 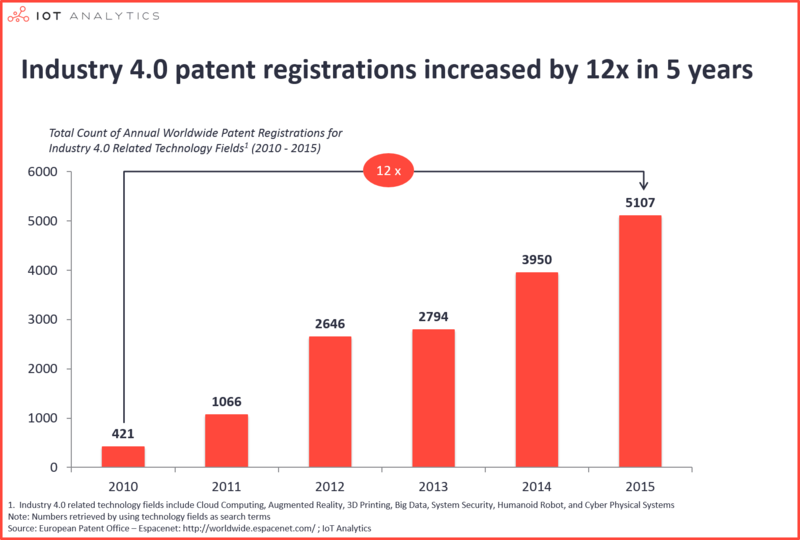 However the fall in patent numbers in 2015, coming short of “only” 1400 patents, might suggest that this technology has reached its peak. The 2016 numbers are definitely to be watched. IBM is the leading company for cloud computing patents. The company has registered patents concerning security services, hybrid data backups or mobile device workload management, just to name a few examples. Cyber physical systems, or CPS, are supposed to be the heart of Industry 4.0 according to the German Federal Ministry of Education and Research. They are seen as the central industrial technology, integrating the cyber world and physical world in an industrial context. 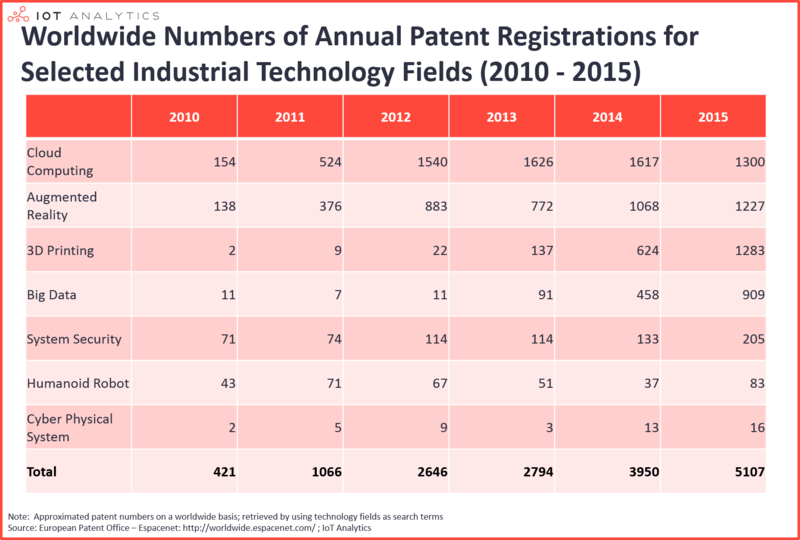 Patent numbers however are low. Adding to only 48 patents over the past five years, CPS fall in last place. They are way behind the leading technologies. This might be due to the fact that it isn’t easy to define the topic in a quick and easy manner and make it palpable. It entails many different sub technologies and seemingly no patents are dedicated to the overall topic. This is disappointing, regarding the huge role it is supposed to play in the next industrial revolution. Augmented reality is on a fast-track it has seen a constant growth in the past years and has made the top three of industrial technologies. For example the German company Ubimax is specialised in augmented reality and wearables for industrial solutions. One of its devices for augmented reality is the pick-by-vision solution “xPick”. These smart glasses help optimise picking procedures and were successfully tested by DHL in the Netherlands. They can now be integrated with SAP EWM. Big data has made a remarkable surge in the past two years, that might me comparable to additive manufacturing. The patent count of both IT system security and humanoid robots is rather low, but nevertheless stable. In the case of system security the low number may prove to be a problem for the future development of the fourth industrial revolution, as it is a basic requirement for its realisation. Assuming that patent developments are an early indicator for the future of industrial technology, we now know which technologies to expect. An explosion of 3D Printing technologies seems likely and augmented reality use cases are soon to pop up in various scenarios. Cloud computing may have reached it’s peak in patent development, with an implementation throughout the industrial world still on the go. 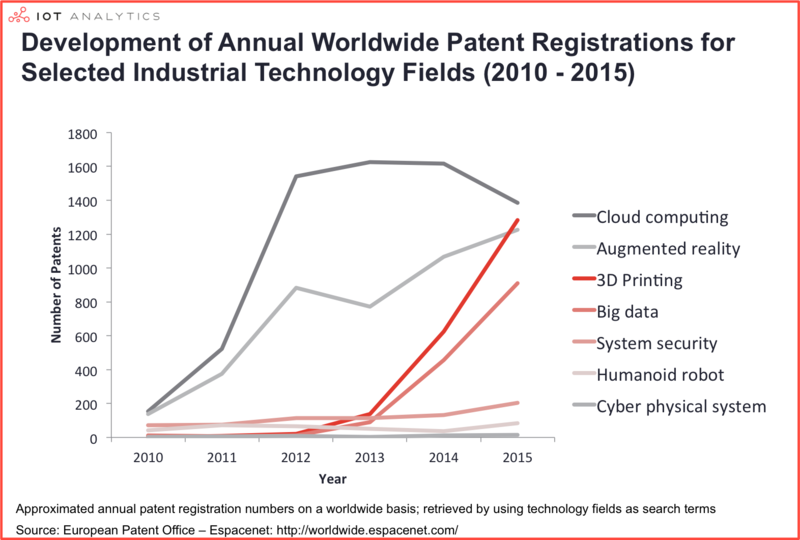 A lot has yet to be expected of big data & analytics that could yet surge as high as the 3D Printing patents. As an industrial company the best way forward is to embrace these four technologies as a core part of the fourth industrial revolution. However, a possible obstacle can be seen in the low attention patent research for cyber physical systems and (IT) system security are getting. With both technology fields being key for Industry 4.0, it is essential to keep up with the rapid development of other technologies. Your interesting research results really inspire me doing research on this direction. I am intended to do patent analysis for Industry 4.0, especially focusing on IoT and CPS. Since the keyword selection is very important for patent analysis, I would appreciate if you can suggest me a number of suitable keywords for IoT and CPS on Industry 4.0. Thank you very much your kind help.